Crystal Palace defender Pape Souare will be out for up to six months after breaking his thighbone in a car crash, says manager Alan Pardew. 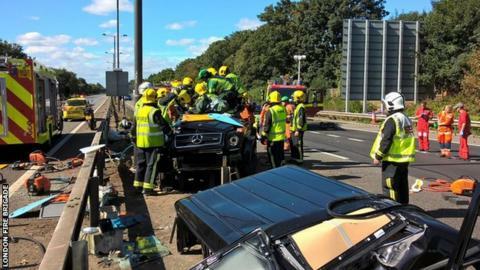 The 26-year-old Senegal international was airlifted to hospital after a crash on the M4 motorway in London on Sunday. The injury also means he will miss the Africa Cup of Nations in January. "He isn't having the best of times, but we're all very supportive," said Pardew. "We love Pape and can't wait to have him back." Souare is expected to be released from hospital on Saturday. When asked how much of the season Souare would miss, Pardew said: "Four, five months. Maybe six, he should be up and running again. "I don't think we have any concerns about Pape returning. It was a broken thigh, that should repair as normal." Palace are yet to learn the extent of the damage to some of Souare's muscles, but Pardew said the player was "very lucky". He added: "It was a terrible accident. We owe a huge debt to the London Air Ambulance and the surgeons who helped him." Souare, who joined side Palace from French club Lille in January 2015, has made 46 Premier League appearances for the Eagles.